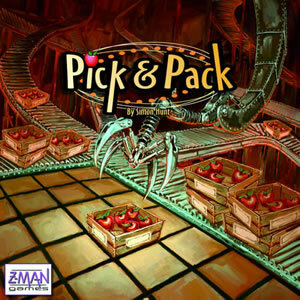 In Pick & Pack, the players are working hard to select the best trays of apples with which to fill their four packing crates. The problem is that both players are trying to use the same tray-selection machinery at the same time. Players score points for the number of apples in their crates. Bonus points can be scored for crates marked as Premium. Players may reduce the value of their opponent’s crates by marking them as Wholesale. The winner is the player with the highest total score after evaluating each crate of apples at the end of the board game. There are 36 apple tray tiles (10 tiles with 1 apple, 8 tiles with 2 apples, 7 with 3 apples, 6 with 4 apples, 4 with 5 apples and just 1 tray with 6 apples). Thes apple tray tiles are randomly placed on the 6x6 central grid, one tile per space. The grabber pawn (black circle) is placed on the tile with 6 apples in the tray. Each player now has to place his 12 action tiles on his action rows, one per space. You do not see your opponents action tiles until you both have placed your action tiles. On his turn a player has to move the "grabber" pawn to another position on the 6 x 6 grid. However, he can only move the grabber in the direction indicated by the double-headed arrow in front of his row of packing crates (Red: horizontal and Blue: vertical). The grabber can always be moved to a space containing a tray of apples. The grabber can only be moved to an empty space if the player has an unplayed action tile at either end of the corresponding row/column. In the example above, the red player can move the grabber to any one of the 5 spaces indicated. The blue player would move according to the other double-headed arrow. 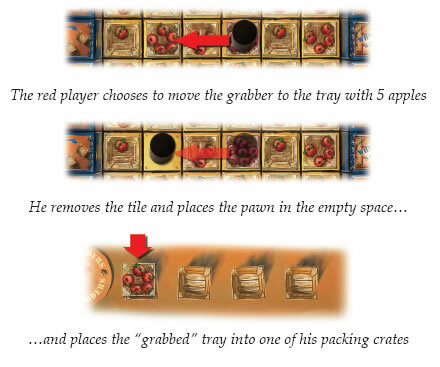 If there is a tray of apples at the selected position, the player “grabs” the tray to add to one of his packing crates. The grabber stays on the empty space in the grid. The apple tray just removed must be placed in one of the player’s packing crates — the one which contains the least number of trays. 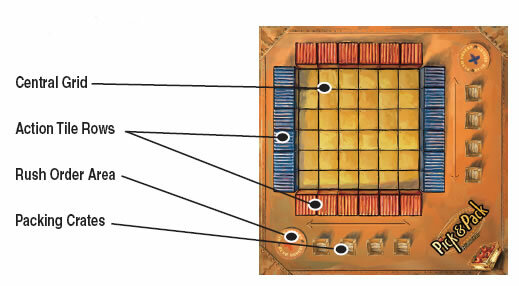 If two or more crates have the fewest trays, the player may choose which of them will receive the tray. Place the tile on top of the crate (forming a stack of face-up tiles). If the player moves the grabber to an empty space, he must activate an action tile from one or other end of that column. The different action tiles and their effects are described later. A player may not move the grabber to an empty space if there are no unplayed action tiles in the corresponding column/row. Nor may he move the grabber to a space which has a face down tray tile on it. It is the blue player’s turn. He can move the grabber to either of the two trays (the 3 or the 1), or to the empty space to activate either “Quality Control” or “Malfunction”. He may not move to either space marked with an X because there are no playable action tiles at the ends of those rows. One player has all four crates closed with Premium and Wholesale tiles. A player on turn has no valid move for the grabber. For open crates: 1 point per apple. For Premium crates: 2 points per apple. For Wholesale crates: 1 point per 2 apples (rounded down). The winner is the player with the highest score. Premium action: To activate this action, the player takes the tile and places it on top of one of his four (still open) packing crates. That crate is now closed and out of play. When scoring at the end of the game, the value of the crate will be twice the number of apples contained within. 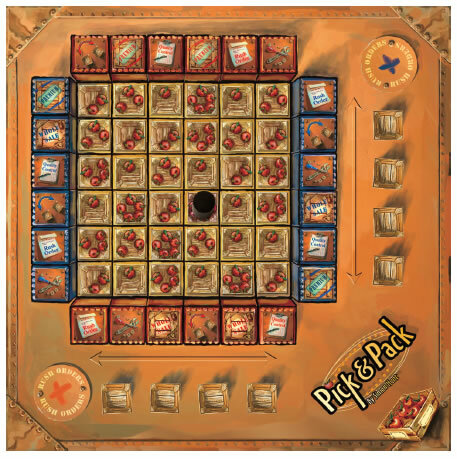 Wholesale action: To activate this action, the player takes the tile and places it on top of one of his opponent’s four (still open) packing crates. That crate is now closed and out of play. When scoring at the end of the game, the value of the crate will be half the number of apples contained within (rounded down). Rush Order action: To activate this action, the player takes the tile and places it face up in his “Rush Orders” section of the board (it is allowed to have 2 unused rush order action tiles on your rush order section). 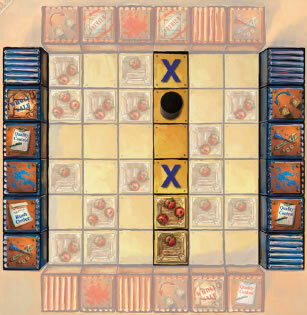 During one of his subsequent turns, the player may select this tile to immediately make another move and the rush order tile is flipped face down and cannot be used anymore. Quality Control action: To activate this action, the player selects the action tile. He then takes the top tray from any of his opponent’s open packing crates and adds it to one of his own (the crate with the fewest number of trays, as usual). After confirming the move, the action tile is flipped face down in place. Order Mix-up action: To activate this action, the player selects the action tile. He then swaps the top tray from any of his opponent’s open packing crates with the top tray from any of his own open packing crates. After confirming the move, the action tile is flipped face down in place. Malfunction action: To activate this action, the player selects the action tile. He then flips face down either (a) any unclaimed apple tray in the central grid (making it unplayable), or (b) any of his opponent’s unplayed action tiles. After confirming the move, the action tile is flipped face down in place.